Philips Zoom WhiteSpeed is the newest and the only LED machine on the market, offering a lesser degree of sensitivity during and following your whitening treatment. Philips Zoom has been proven to whiten teeth up to eight shades and it is also safe and effective mechanism to remove staining and brighten your teeth. This procedure is carried out either at the office or at your leisure via custom fabricated trays designed to fit your teeth. It can allow for fast predictable results. Over-the-counter whitening products are not customized to your needs. With Philips Zoom, the whitening process is tailored to your needs by just the right light intensity and duration in the dentist’s office. With Philips Zoom, your teeth will be visibly whiter in one day in just 45 minutes treatment time. Inlays and onlays are used when large, defective fillings or tooth fractures need to be fixed. Inlays and onlays are made of porcelain and cover the grooves of the teeth. The difference between an inlay and onlay is that an onlay covers one of more cusp or corner of the tooth as opposed to the smaller inlay. Also used to replace large silver fillings, they can strengthen the tooth by acting as a core or backbone to the tooth, hence maintaining tooth integrity. The onlays and inlays differ from composites since they are harder and more durable than a composite filling and do not stain over time. They are cemented to the tooth’s surface, creating a watertight seal. 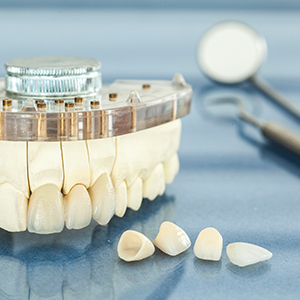 As opposed to crowns, onlays and inlays are a conservative option, saving more of your natural tooth structure. A simple and minimally invasive procedure used to correct mal-posed, chipped, stained or unaesthetic teeth. Form fitted extremely thin porcelain covers are cemented directly onto the tooth’s surface and offer a conservative alternative to crowns. Porcelain veneers and lumineers will deliver highly esthetic results in the anterior and posterior regions of the mouth. This cosmetic procedure can maintain its brilliance and strength for a long time and is key in delivering a smile makeover for the individual.